In the early morning of the 19th October 1864, Captain John G. Healy of the Ninth Connecticut Infantry had his men stand to arms at their breastworks on the east bank of Cedar Creek. ‘The Irish Regiment’ was part of the Union XIX Corps of Major-General Phil Sheridan’s Army of the Shenandoah. Now reduced to battalion strength, Healy and his small band of men had been alerted by the sound of firing from their left flank, where the VIII Corps positions were. As the commotion intensified, it became apparent that Confederate troops of Lieutenant-General Jubal Early’s Army of the Valley had flanked the Federal positions, routing the VIII Corps in the process. The situation of the XIX Corps and Healy’s Connecticut Irishmen was now extremely perilous. As the XIX Corps began to feel the full force of the Confederate assault, the Ninth had no option but to retreat. Captain Garry T. Scott of the Regiment described how they were ‘driven out of our fortifications’ being forced to fall back ‘several miles’. Moving along their line of works, they withdrew from one position to the next as the Rebel wave came on. As they attempted to form with a portion of their Brigade, Healy could see that the retreat was fast becoming a rout, with ‘men of other regiments…running by us, going in all directions to the rear’. However, as the Confederate attack ran out of steam, it was a case of cometh the hour, cometh the man. The Ninth’s army commander Phil Sheridan was not about to let his army disintegrate. Captain Scott recalled that The Irish Regiment colors were ‘the first planted on the recaptured works and were the first to advance in the charge’. 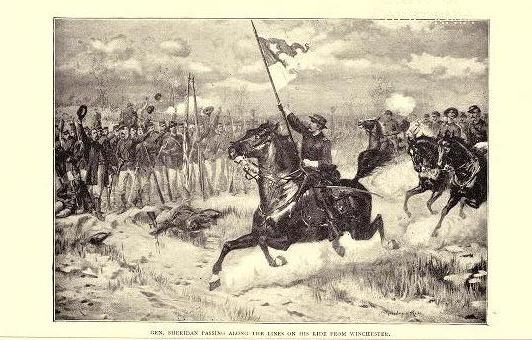 Captain Healy himself carried the state colors for the first part of the charge, until he found that it restricted his ability to issue orders. Captain James Graham of the Ninth would look back on the battle years later as one of the Regiment’s finest achievements, and as a place where the unit had ‘greatly distinguished itself’ with the ‘colors of the battalion in the van of all other flags on that field‘. He remembered the private who carried the national flag (John T. Morrow), as well as the corporal and two officers who were with him at the forefront of the attack, as the ‘four daring spirits who led the Federal army in the victorious charge that finally overthrew Early and ended the valley campaign’. The Battle of Cedar Creek was indeed the decisive battle of the Valley Campaign of 1864; the threat to Washington D.C. dissipated and Early’s troops would eventually return to the Army of Northern Virginia. The Ninth Connecticut lost two men killed, fifteen men wounded, and eight men missing during the engagement. Today, the battlefield of Cedar Creek is on the Civil War Preservation Trust’s most endangered battlefields list and needs your help to preserve the site for future generations. Official Records 43. Report of Captain John G. Healy, Ninth Connecticut Infantry, of Operations October 19. Just curious are you researching the 9th? Ive been researching the 9th Connecticut for about 20 years , had a ancestor in it. In the photograph you have of the 9th officers is also John Bolger. He was a Sgt in the Confederate Army captured at Ft Jackson below New Orleans and joined the 9th and rose to 1st Lt. The 9th recruited about 200 men in New Orleans. That is absolutely fascinating! I wasn’t aware of that- were many of the New Orleans men they raised Irish?. I’m not researching the 9th at the moment (I am working on the 5th Confederate Infantry, mainly Irishmen from Memphis). They are a very interesting regiment though, I’m hoping they will feature in a few more posts over time! Yes the 9th took in about 200 men and 7 colored men to be cooks in New Orleans. Bolger was in the Regular Confederate Army. Not a state unit but one of only 2 regiments of regular Confederate Army. He was a Sgt and was on the gunboat Mississippi captured at the Forts and went over to the 9th. After the war about 5 ex 9th officers took jobs in New Orleans in the goverment and Bolger got a job in the New Orleans Police Dept under Lt Lawler who had been a Lt in the 9th Connecticut. The statue put up at Grants Canal in Vicksburg dedicated to the 9th Connecticut is one of the first statues put up there in many years take a look at it beautiful statue. There is also a 9th Connecticut website you may want to look at. We have the wreath laying of the 9th Statue in New Haven Connecticut this weekend. 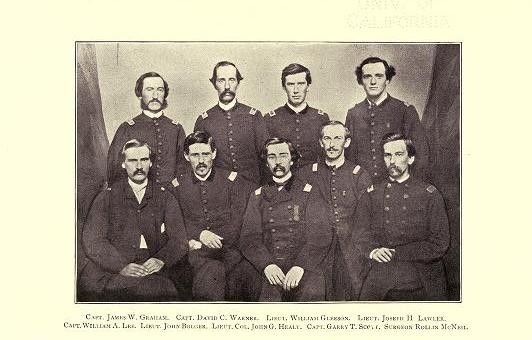 The 9th Connecticut include d Lt. Lawrence O’Brien, on e o fthe few Americans who escaped captivity as a Fenian in Ireland in 1866. One thing to remember. The 9th did not have their Irish flag at Cedar Creek. When the regiment demobed only enough men reuped to stay in so they were formed into a 4 company battalion. Lt Col Healy was Co and they had 4 companies under Capts Scott, Sheridan, Lee and Lt Graham. The 9ths old flags were turned in and they received new colors.The new 9th state flag was not of Irish Design it was the typical Connecticut State flag that all Connecticut regiments carried. Many thanks for that info Joe and for sharing it with us! That would be an interesting connection to have! Hopefully some of our readers can help! Trisha your best bet is ancestry.com. They have plenty of info on Sheridan. You know his birth has been kinda fudged some say he was born in Ireland or on the boat on the way over, Sheridan says he was born in USA. As for his relatives and yours being related ancestry has plenty of family trees. I found a lot of other people research my same Irish Civil War ancestors so you should have so luck there. The 9th Connecticut a all Irish unit had a Italian immigrant as their Chaplin and at one point Sheridan was going to have him hung as he thought he was giving aid to the enemy. I recently discovered that my g.g. grandfather James J. Condren (1840-1878) enlisted in the 9th Connecticut shortly after he arrived in the U.S. from Ireland. His CSR shows him enlisting 22 Sept. 1861 and being part of it until May/June 1865. His record says he was born in “Seven Churches” Ireland which I’m thinking may be County Offaly. After the war he worked, according to city directories, as a gardener at the Colt mansion in Hartford. He married Mary Eloise Campbell who came from County Westmeath. They married in Hartford 23 Aug. 1868 (St. Patrick’s Church). They are buried in the Mt. St. Benedict Cemetery in Bloomfield, Harford County CT. I am new to both military research and research in Ireland (lots of Irish ancestry but he’s one of the first I’ve been able to identify a specific hometown for). Any suggestions about how I can learn more about my soldier and his experience? Thanks Joe. It sounds like this is a real passion of yours. If you have anything on my ancestor James Condren I’d love to know about it. A CDV would be a dream come true (I have no photos of him) but I’m not holding my breath. His CSR notes that he was demoted at one point from a Corporal to a Private by Col. Cahill but it doesn’t say why and overall his record seems good. Any idea why this would have been? 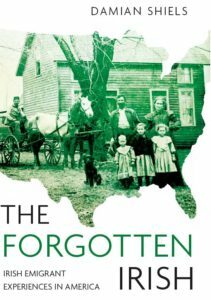 Is there anything you can suggest that I can read to help me “flesh out” this period of my ancestor’s life? Many thanks for this information! There will shortly be a new book out looking at the 9th Connecticut among other units by Ryan Keating so worth keeping an eye out for. Also you can access an online version of the 9th’s history on the Books page of the site.